Give the Sacred Heart picture a place of honor in your home. You and your family will have His special blessings and protection. "I will establish peace in their families." A lady who was married to an alcoholic for over 18 years told me how her abusive husband used to pick fights with her frequently. This lady put a small picture of the Sacred Heart in the room where he usually picked fights with her. Suddenly, he no longer hit her or verbally attacked her in that room. But he began doing it in a different room. She put a picture of the Sacred Heart of Jesus, not only in that room, but in all the rooms of their house. And then she had peace in every one of those rooms. That left the garage. After the first fight there, she put the picture of the Sacred Heart in the garage as well. For the first time since their marriage, the entire home was totally at peace! 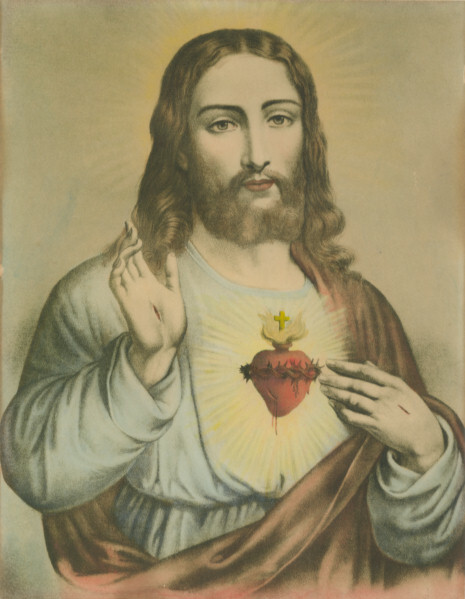 Those of you who have fight-prone spouses, or bosses, would do well to put a picture of the Sacred Heart of Jesus in every room of your home and also where you work!